All are sourced from original nitrate or preserved 35mm stock, and feature the versatile musical accompaniment of The Ragtime Skedaddlers. The local talent films are presented by courtesy of the Wisconsin Center for Theatre and Film Research, the Academy Film Archive, and the Tennessee Archive of Moving Images and Sound. Celebrate the passion of do-it-yourself cinema. 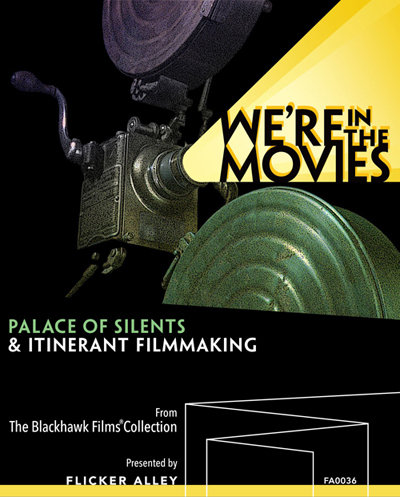 This unique Blu-ray/DVD collection features two documentaries never before seen on home video, When You Wore a Tulip and I Wore a Big Red Rose and Palace of Silents, as well as five bonus films from early itinerant and local filmmakers. We're in the Movies includes an original essay by film historian David Shepard. Additionally, this Blu-ray/DVD combo set features five early examples of the cinematic tradition of itinerant filmmaking. The Lumberjack (1914) is the oldest film shot in Wisconsin that still exists in its original, complete form. Produced by an itinerant film company out of Omaha, Nebraska and cast with Wausau, Wisconsin locals, the short, silent one-reeler tells a romantic story set against the backdrop of the city's lumber mills. Our Southern Mountaineers (1918), In the Moonshine Country (1918), and Mountain Life are a trio of shorts that document the lives of some inhabitants living in the eastern mountains of Tennessee and in the 'moonshine country' of northern Georgia and Kentucky. Also included are Huntingdon's Hero (1934), a local talent film made in Huntingdon, Pennsylvania, and a newly-restored, 2012 selection for the National Film Registry, Melton Barker's The Kidnappers Foil (1937), which features a local troupe of children from Corsicana, Texas enacting Barker's basic story of child abduction and escape.